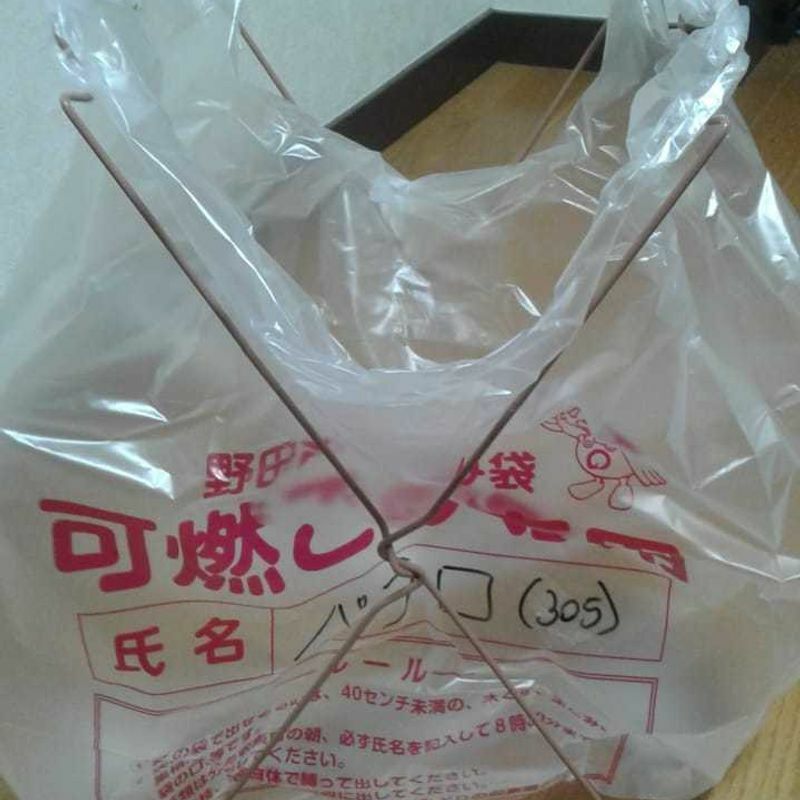 The first thing you must know about living in Japan is that they use a lot of plastic here, for example, in the bags of cookies or marshmallows, each one of them is wrapped in their own personal bag. Crazy, I know. But, the second thing you must know is that the recycling policy is a very important thing here and it's taken very seriously. That's why, I think, they allow to each cookie or marshmallow its own package. Now you know this, you have to deal with the fact that the process of recycling begins at home so you must learn and follow the local policy on recycling. I said "local" because each city has its own policy. I'm living in Noda-shi (Chiba-ken) so I will be talking about Noda's policy on recycling. The City Hall of Noda gives you a whole book of instructions about how you are supposed to divide the garbage (see photo). They establish that we have to divide the garbage in two bags (see photo): the blue ones are for 'no burning trash' (this is what usually is considered the recyclables) and the red ones are for 'burning trash' (this is mostly the organic trash). This isn’t that hard when you get used to what trash goes where, but you must know that PET plastic bottles (they have the word PET written on them so you can recognise them – see photo), glass, cans and cartons do not go in any of those bags. You have to take them to special places, such as supermarkets that have a place to dispose of them. For large items like furniture and that kind of stuff, you have to call a specific phone number to request the people at the City Hall to pick them up. For me this was difficult to learn but the hardest thing was getting in the habit of doing it. First of all, I had to buy two trash cans (I got in hyaku (100) yen shop these metal structures where you tie the bags - see photo), then I had the challenge of finding them a place in the kitchen where they wouldn’t bother me (I put them under the sink) and finally, I have to deal with the fact that I had to wash all the recyclables (bottles, cans, plastic holders, etc.). This was the hardest part but I survived by using a mental technic: every time I found myself washing trash (because that’s what in fact you are doing) I repeated in my head as a mantra "this is not for me, is for the planet". When you get that idea, everything changes. A tip that was great for me was to reuse all the glass jars (tomato sauce jars, marmalade jars, etc.). When they become empty, I clean them and reuse them as storage (see photo). This is a win-win tip because you recycle while gaining an organized home. I hope you enjoy reading about my recycling experience, but mostly I hope I gave you some good ideas that will help you to confront this particular activity that we face when we live in Japan.